This skeptic of course doesn't believe in a historical Buddha; but if there had been, when would he have lived? Most scholars now believe that Buddha lived much later than the traditional date adhered to in Sri Lanka and Southeast Asia, which places his death at 544--543 BCE. This revision was brought about by a major Buddhist symposium, convened by Heinz Bechert at the University of Göttingen in 1988, which brought together scholars from around the world to examine the issue from every position, discipline, and language imaginable. The symposium offered dates for the Buddha’s death ranging from 483 BCE down to 368 BCE; most participants suggested that the Buddha died within a couple of decades on either side of 400 BCE. Taking the most recent date proposed for his death, 368 BCE, (favored by Bechert) and since he supposedly lived eighty years, he would have been born in 448. While on the surface this new dating for the Buddha’s death doesn’t seem earthshaking, either for Indian history or Buddhist studies, yet it is. Virtually everything we know about the earliest Indian Buddhism, and especially its sectarian movement, is once again called into question. Prior to the Göttingen symposium, there were four basic dating schemas for computation of the Buddha’s historical dates: (1) the long chronology; (2) the “corrected” long chronology; (3) the short chronology; and (4) the “dotted record.” Each one has problems; I won’t go into the details of all of them, just the first one. For more information, see here. The long chronology, adopted in Sri Lanka and Southeast Asia relatively recently, suggests the date of the Buddha’s death is 544--543 BCE, derived exclusively from Theravadin sources such as the Dipavamsa, Mahavamsa, and Samantapasadika. This date is accepted by virtually no modern scholars of Buddhism, the reason being that the chronology places Buddha’s death 218 years before the consecration of King Asoka, but assumes the date of his coronation to be 326 BCE. But according to Richard Gombrich, “Asoka’s dates are approximately established by the synchronism between his 13th major rock edict, which is dated by scholars in the 13th year after his consecration, and the five monarchs of the Hellenistic world named therein as reigning at the time. The date of the edict must be 255 [BCE], give or take a year; Asoka’s consecration is accordingly dated 268 [BCE].” In other words, there is a slippage of sixty years in the long chronology which cannot be accounted for. Can we say anything with certainty based on the symposium? No; we’re as much in the dark as we were about the years the Buddha lived, which is all grist for the mill for skeptics like myself. If scholars can’t agree on a supposedly historical figure’s birth date, and vary by centuries in their estimate, then this is a problem. Moreover, although all the texts examined agree that a first council was held in Rajagraha during the first rainy season following the Buddha’s death, many scholars suppose that this event may have been fictitious, invented upon the occasion of the second council so as to lend authenticity to the sequence of events following the Buddha’s death. Think about it, India fourth century BCE; how are they going to contact all the delegates and get them to come to one place on time? India then was a sparsely populated country with poor communications; most of the mendicant monks must have been in jungle retreats, etc. It’s hard enough to bring 500 monks together in the 21st century. There is rising evidence that Prince Sidhdhartha was born in Sri Lanka then known as Janbuddweepa (meaning the birthplace-jan of the budhdha-budh, Dweepaya-island). He attained budhdhahood at Hiriwadunna which is the epicenter of srilanka geographically (madya mandalaya). The thripitakaya carries a lot of information on this matter which have been misinterpreted by ordinary people (pruthakjana) over the years. Asoka knew best. He was responsible for Buddhist missionaries. 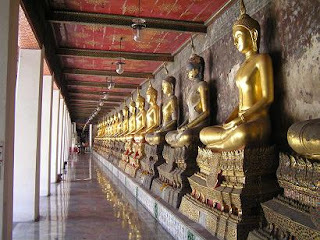 Sri Lanka received Buddhism from Him and Burma received Buddhism the second time from Sri Lanka. Dont over think. Jesus also was a Buddhist monk.